Now is the time to get what you want and pay no interest over 12, 24 or 36 months with easy weekly, fortnightly or monthly repayments. It’s really simple and there is no commitment to purchase. Then contact us, Wesglo Electric, to arrange an appointment or visit our office. Please ensure you bring along the “Welcome Confirmation” email and a form of identification (e.g. your current Driver’s Licence) to complete your purchase. *Approved applicants only on a Once 55 Day Visa card. Terms, conditions, fees and charges apply including a $99 Annual Fee charged on the account open date and annually on the anniversary of the account open date. Minimum finance amount applies and is based on the promotional term. Interest, currently 19.95% p.a., is payable on any balance outstanding after the interest free period. Ask in-store for details. 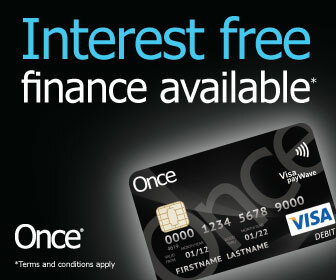 Finance provided by Once Credit Pty Limited ABN 99 112 319 632, Australian Credit Licence Number 386194.